I’m surprised that people mention this thing but there is no forum topic around it. So here it is. For those of you that don’t know what this is its Acebeams’ newest arrival “yet to be released” its a bit of a monster. It will produce a 40K lumen max output. Pussycat pussycat where are you? What's up pussycat meow meow meow. "Tom Jones"
OFc there is a thread of this beast search is your friend. We talk about it here in my thread on actively cooled lights as well. I mentioned the X9R as it USED to be actively cooled, but it’s a regular light now. yeah it used to be… but that’s a major battery drain…. No its not. It’s negligible. A typical 40mm fan uses roughly 1.2 watts. So for 3 of them, let’s say 5 watts total. When you add that 5 watts to a light already drawing 250 to 300 watts, the fans amp draw is under 2% which I consider negligible. Yes, but the fans will not run if the light reaches a certain temperature. And as JasonWW said, it is just negligible at 2%. In fact, keeping the LEDs cooler using active cooling will probably be saving a lot more than 5W. TLDR: Active cooling at such high power levels can actually reduce power consumption. It will need to use batteries capable of a little over 10A each. The fans only need to run above a certain temperature (maybe only above 60°C?). Once Turbo is changed to High for instance the fans may run less or cycle to prevent over heating. The PowerTac X10000 Destroyer only has a single fan (it might be bigger than 40mm, though) and it can maintain 10k lumen just by cycling on and off. This greatly reduces the fans power consumption. The X70 probably won’t even need to use the fans unless over 7k lumen and after several minutes. I don’t think active cooling reduces power consumption. It very slightly increases it. No, I meant that if the light is regulated at a certain brightness level, active cooling will decrease power consumption compared to no active cooling due to the fact that the forward voltage of an LED going up as it heats up. So active cooling will actually decrease the power usage by maybe 10-15W if done right. I think I understand what you’re saying, but you might be saying it in a way that’s a little confusing to me. Flashlights are not capable of monitoring there output in lumens. To do that would require some type of optical feedback loop which isn’t practical at all. So all the driver can know is how much amperage is going to the emitters. It’s up to the designers and engineers to use enough amperage to generate the amount of lumens they want. I don’t think the designers and engineers have to take into consideration the changes in the forward voltage as the light heats up. If they measure the output using ANSI-FL1 standards, then they measure at 30 seconds. So I assume there’s no power usage decrease due to the active cooling. This is a bit beyond my knowledge, though. Maybe someone like Lexel or DEL (a driver designer) could go into more details. I’m sure it is. It held up the X9R for a very long time until they scrapped the active cooling. It adds a tremendous amount of complication plus Olight and Acebeam also have to worty about their warranties. I know Olight has 5 years warranty, but I’m not sure about Acebeam. I assume it’s pretty long, though. It’s hard to keep the fans working well in dusty, dirty or wet environments for the duration of the warranty period. I don’t know if the X70 can do 40k lumen for 30 minutes, but I did crunch some numbers and the batteries seem capable of handling it. I think the triple fans might be able to just barely handle the heat load. I think it’s physically possible it can do that, but can Acebeam build it to do that? We will have to wait and see. Even if it can only sustain 30k or even 20k lumen that would be record breaking. Right now 10k lumen is the record and I’m not even positive that light is doing 10k. It has not been tested. It’s rated at 10k. Doubt it could physically run 40k lumens for 30 min. Well, being a 40000 lumen light and having 12x XHP70.2s, it must be pushing out about 3400 lumens per XHP70.2. 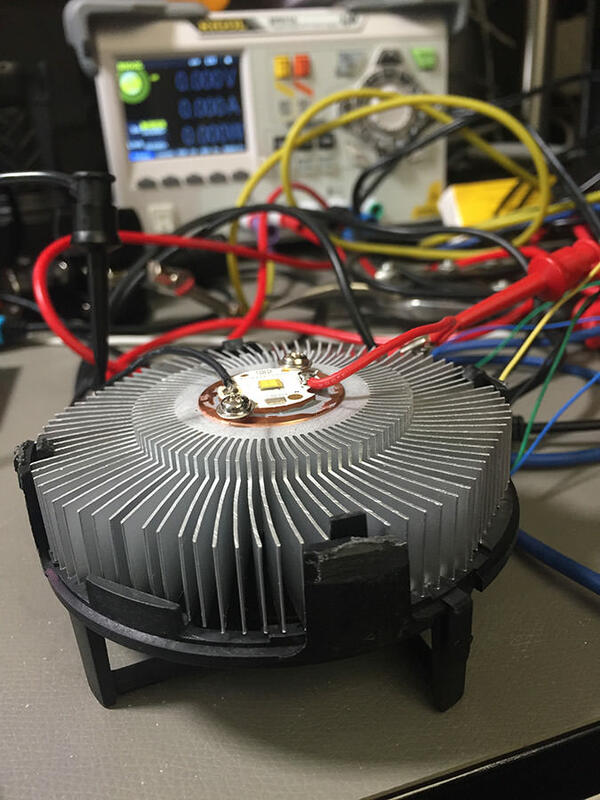 Knowing that an XHP70.2 consumes 22W at that power level, it means that the light is consuming at least 270W of power at max brightness. Even if you were using NCR18650GA and not taking into account internal resistance, you would have at max a battery capacity of 100Wh. 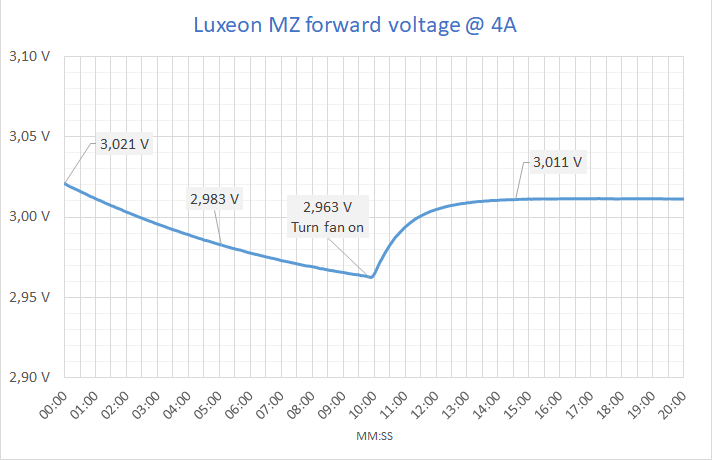 Meaning at 40k lumens, you would have a max, down to 2.5V, runtimes would be a max of 20 mins, not 30 mins. That would be even less down to 3V and counting internal resistance, and that the cells are probably 30Qs and VTC6s, not 3500mAh GAs. It is physically impossible to get 30 mins even with an 8 cell battery pack at 40000 lumens. Maybe 30000 lumens, but not more. It would need 30Q’s not GA’s. Sustained 40k lumens doesn’t sound possible, does it? The PowerTac 10k seems to cycle it’s single fan. So if the X70 has an efficient heatsink design with each fan cooling 1/3 of the heatsink area, the fans run continuously and power output drops with battery voltage, then maybe it is possible. 40k lumen for 30 minutes is quite a record. Even if output starts to slowly decline. I have no idea what driver design they might be using. 40,000 ÷ 12 = 3,333 lumen per emitter. That’s roughly 3.5A per emitter. 42 amps at the 6 volt level or 21 amps at 12 volt level. 21 amps at 13 to 14 actual volts would be 273-294 watts. As far as the batteries, it’s using 8 × 18650. If the cells were 4S2P (like the Imalent DX80) that would require at least 10.5A per cell. Good cells like 30Q should handle that amperage and temperature it seems (internal battery temp due to the heavy discharge, not heat from the head). So maybe it is possible. I was not expecting 3 fans. That could be the key to maintaining the high output. Even if your down to 30k lumen when the LVP kicks in at 30 minutes it’s still a remarkable feat. I was saying it is possible to run in turbo for 30 minutes. I don’t think it will maintain the 40k, though. As voltage drops, the output would drop. I don’t know if the X70 can do 40k lumen for 30 minutes, but I did crunch some numbers and the batteries seem capable of handling it. I think the triple fans might be able to just barely handle the heat liad. I think it’s physically possible it can do that, but can Acebeam build it to do that? We will have to wait and see. Hmm.. nice points… I hope they pull it off; groundbreaking if they do.. But it would not matter much anyways. Vf goes down as the LED heats up. Thank you. I always thought it was the opposite, since in my LED builds, using my constant current supply, as my LEDs heated up, so the voltage went up. Never seen that happen. Did you measure with a DMM from the LED wires instead of trusting the PSU? Another test with another LED where I turn the heatsink fan on at 10 minutes. 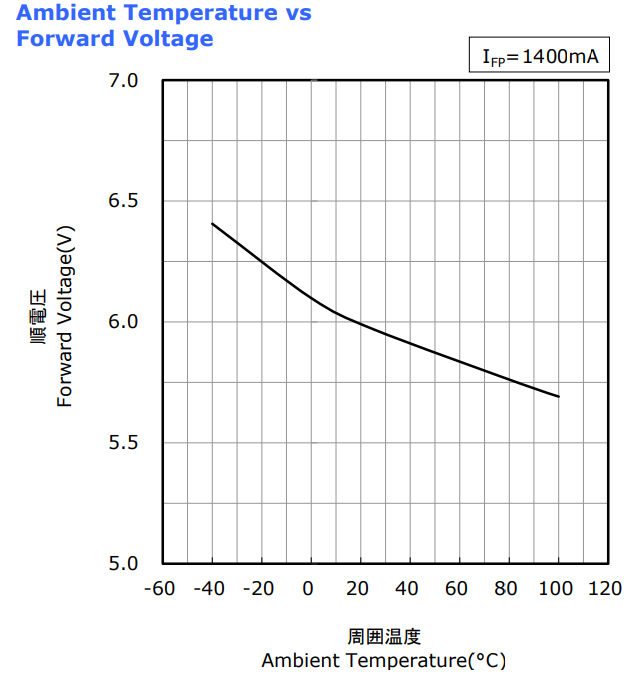 You can even use diodes (which LEDs are of course) as temperature sensors, because the relationship between temperature and forward voltage is pretty linear (for Si diodes at least, don’t know about LEDs). 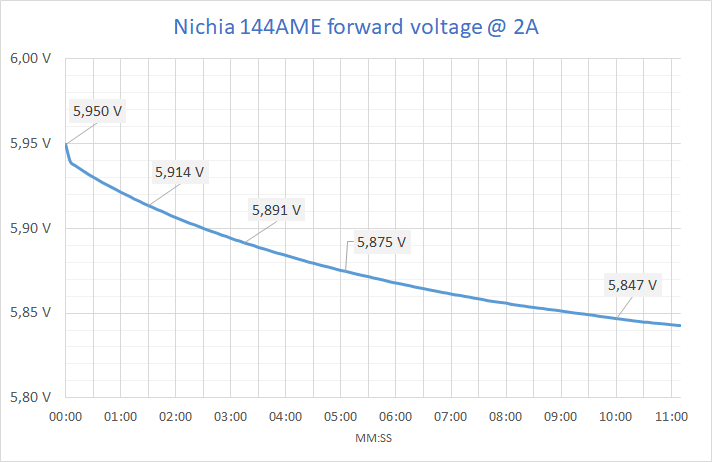 That’s true, for example the Nichia 144A is very linear from 20°C upwards. Use a very small current not to heat up the LED itself much and it can be used to estimate ambient temperature. The exact reason “why” is pretty much a entire undergrad class in silicon junctions. Needless to say it involves quantum effects with the bandgap. I guess an ELI5 answer would be that the increased thermal energy can give lower voltage electrons a push across the bandgap? That is probably wrong on several levels though. The effects of a falling Vf are huge though. It is why LEDs need current regulated supplies. Otherwise you get a thermal runaway and the LED destroys itself. Anything with a negative temperature coefficient will need regulated current. Very few things have negative coefficients and voltage regulation is sufficient. On a related note I’m always kind of amazed that direct drive FET lights work at all. The wires and contacts and the battery itself form a positive coefficient that magically balances out against the LED that is trying to self destruct.